In Manhattan with the Bolivian-American artist, whose epic productions mirror the messy beauty of modern life. When we met, Crampton was sitting on a couch inside a fourth-floor conference room on the Upper West Side. The nondescript lounge was a makeshift backstage area for the David Rubenstein Atrium, a leafy public space where Crampton had just put on a multidisciplinary performance. For about 45 minutes, she deployed, among other things: guttural Spanish-language screams, historical images showing violence against trans women, and aggressively beautiful electronic music that, at points, sounded like the score to an off-kilter adventure movie. On stage, she wore a leather jacket, a beet-red tank top, and military dog tags inscribed with the logo for NON, the record label co-founded by her friend Chino Amobi. A lot of the live mix sounded like music from her new full-length album, Elysia Crampton Presents: Demon City, a delirium-inducing project that she wrote and recorded alongside four kindred producers: Amobi, Rabit, Lexxi, and Why Be. “They were always already informing my work,” she explained of her choice to make something collaborative. “Whether I acknowledge it on an album or press statement, they’re there.” While each of these electronic provocateurs has their own distinct voice, they all pull from a dissociative, in-your-face sonic palette in order to reflect and disrupt modern life, to show how our world can be simultaneously pretty and straight-up terrifying. They make some of the most punk music imaginable, even though it almost never includes guitars. On “Children of Hell,” a song that Crampton made with Amobi, a sparse reggaeton melody slithers forward while a noisy groundswell — featuring space lasers, evil genius laughter, and syncopated explosions — climbs purposefully toward cathartic pandemonium. Making Demon City has been an inspiring experience, Crampton said, and she’s excited for whatever’s next. Her art, and the art made by her collaborators, is more visible than ever. It’s helping her, a trans Latinx woman, not just survive, but thrive. “I’m really happy for my friends, and my work ethic is better,” Crampton said, picking up a very small bottle of Jägermeister, which she told me is her favorite. “I’m able to navigate capitalist, imperialist society better,” she explained, noting that by embracing some aspects of it (computers for composing music, planes for travel), she’s able to negotiate a future. It’s a paradox, she told me. Those things are limiting and exclusive, but they’re also the gateway to her freedom. Crampton’s outlook reminds me of the gorgeous final section of June Jordan’s poem, the same one she had stuck in her head. It was published in 1983 by Barbara Smith and Audre Lorde’s feminist press, but feels as relevant as ever. This is a good time. This is the best time. This is the only time to come together. Fractious. Kicking. Spilling. Burly. Whirling. Raucous. Messy. Free. Exploding like the seeds of a natural disorder. Crampton’s work similarly suggests that hope can be found in even the most dire of socio-political situations, and that friendship is survival’s closest ally. 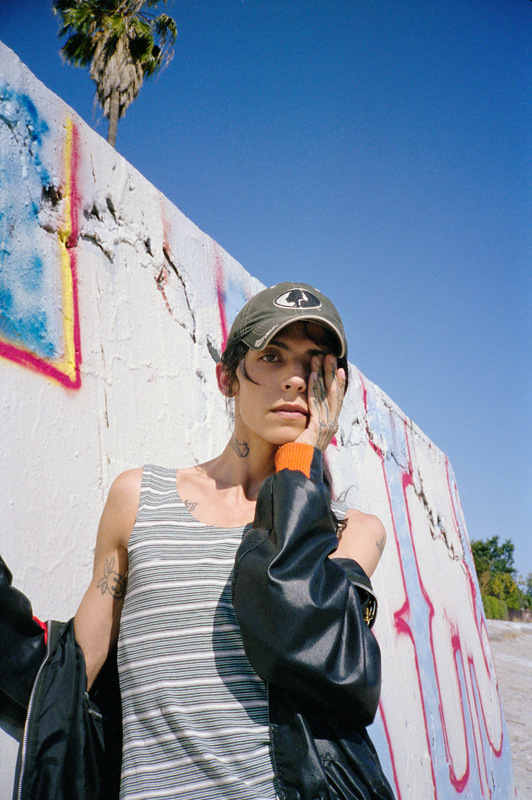 If the “natural disorder” that Jordan wrote about had a sound, it would probably be a lot like the music of Elysia Crampton. Order Elysia Crampton's issue of The FADER right now.